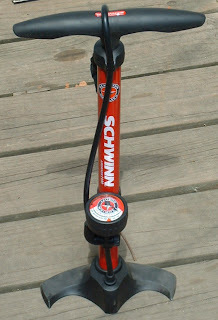 Mass-market store bike pumps are almost all optimized for mountain bikes. This means that they have relatively large barrels giving a high volume of air, at the expense of not being able to reach very high pressures. These also typically have "regular" Schrader valves, rather than the Presta valves typical of modern road bikes (but rare at mass market stores). To get a pump that will work well for road tires, you usually have to go to a bike store and pay $40+. 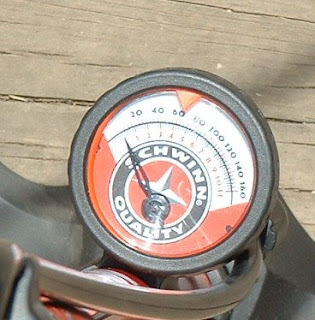 The Schwinn Airdriver 1100 was about $15 at Meijers. It is the only pump I've seen at a mass market store that will work well for road bikes. Claims to be rated at 160 PSI, and comes equipped for both Schrader and Presta valves--In fact, they give two options for Presta. There is an adapter that stores in the release lever for occasional use, or for dedicated Presta use you can unscrew the gasket retainer and reverse the rubber gasket and plastic valve pin. The threads are very fine and plastic--it takes concentration to avoid cross-threading these, so I'd leave it in Schrader mode and use the adapter if you need it for both types. The lever is aluminum, and feels more solid than most inexpensive pumps. The head also comes with a basketball needle and a pool toy inflater--you would be pumping forever for a pool toy of any size. It appears that the basketball adapter is permanent, and there is a valve arrangement, but I couldn't get it to work, and wound up breaking the needle. No instructions, so maybe that is just an overly complicated storage space. The pressure gauge is raised a bit, although it should be either higher or have a better scale design. The gauge isn't easy to read fine graduations, although it does come with an adjustable arrow you can use to point to the pressure you want. I'd like about 8 inches more hose, but there is enough. The base is a little bit flimsy, but adequate. I'll probably reinforce mine with epoxy. As much as I'm complaining, this pump is a bargain if you have road bikes--it is less than half the price of other pumps that can reach road bike pressures, and nearly as good. The flimsiness of the base is the only major concern I have. Thank You. I hated the pump until I read your comments on the adapters. After a lot of engineering experiments, I finally figured out how to use it with the Presta. I decided to go with the permanent set-up after about 10 minutes of fussing with it. I never got it to work with the adapter. 2. Rubber gasket goes in next with the large hole down into the nozzle and small hole showing. 3. Screw top back on. It worked great. Thanks for posting this it's the only thing I found that helped. The adapter may not be intuitive if you aren't used to using them--It adapts the Presta valve to Schrader, rather than adapting the pump. Undo the Presta valve nut, thread the adapter on to the Presta stem, then inflate like any other Schrader valve. On my Presta-valve bikes, I like to keep an adapter stored on one stem instead of a valve cap. That lets me use any pump in a pinch. I have this same pump and after a long time fiddling with it I finally understand how it works. I never knew how to get air from the main pump into the needle that swivels on the top. I always thought the air has to come out of the needle without taking it out because the slot it is in is to fancy to be just a housing. Finally I got it to work. The needle for the ball pump is meant to stay where it is but can be removed. When you flip up the needle and push it into a ball the pump will detect pressure forcing back into the pump triggering some sort of mechanism (I think some kind of tiny ball bearing inside) blocking the main valve and opening the needle valve. Same goes for the tire pump portion. If air is forced back into the pump through the main pump then air will come out of that pump. I hope this helps. Thank you so much. I was either going to buy a $15 to $20 adaptor or a completely new pump. You instructions worked perfectly. Was pleased to find your objective review of this pump. I happened to see one in a thrift shop today. It looked new, with all the fittings, and as it had the Schwinn name on it, and had the narrow barrel, I was happy to buy it for $3. As you say, the many people who have written slagging reviews, probably have not ever taken the time to read about why the Presta valve became the standard for serious road bikes, several decades ago. And the fact,as you point out, that the brass adapter's purpose is to make the bike's valve compatible with the pump, rather than the other way around. Right away I was able to quickly get the right pressure in a sample tire. Not sure how accurate the gauge is, but it serves its purpose well. I will keep it in the default Schrader mode. I think it will be one of my better buys. If you can let me know what happens when you try, I may be able to help. I too have just finished an hour with the pump. The real problem for Schrader users is this: all the pumps won't fit properly onto the valve stem, pushing the stem in the tire. Then they figure they need the Presta valve (like me), but that doesn't work either. 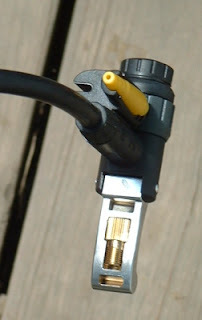 What is really needed is a brass Schrader connector like the Presta. Mine doesn't work and I'm taking it back. But thanks for your help! If I hadn't read your blog, I just would have thought I was an idiot. (I have 2 post graduate degrees, and though not mechanical, admittedly, I am NOT an idiot). The locking mechanism when using the schrader bike pump is backwards, but once you figure that out it should be easy to use. Instead of trying to put it on the tire with the "arm" on the nozzle out, push the arm in, and push the nozzle onto the stem until you hear air. Then, pull out the handle (on the nozzle) locking it on. It's backwards from old school pumps, but it works well once you figure it out. Backwards depends on point of view-you're right when comparing it to other inexpensive pumps. I"m used to bike store type pumps, and the majority of them have heads that work like this one-The 'lever down' position has the gasket uncompressed, best for storage. Flipping the lever up seals them around the valve. I am having a problem putting the parts of the nozzle back together after taking them apart (the top, the rubber gasket, and the plastic valve). Chris from Long Beach tried to explain how they go back together, but nothing seems to be working. Intuitively, it seems that the plastic valve should go in first, with the bigger end pointing down, the rubber gasket in second with the small hole down (allowing the different attachments to fit on) and then the top should screw on. However, I cannot get the top to screw on no matter what I try! It screws on fine when the rubber gasket is not on, but because it sticks out the top a bit, it simply will not screw. Are there any suggestions? I've tried every possible combo, and I wonder if I need to apply more pressure or learn some kind of trick? Lever should be down, regardless of which way you are assembling. There are two ways to do the gasket-"regular (schrader)" or "expensive bike (presta)". The plastic piece goes in first--for a normal bike, with the plastic peg visible. The gasket goes in next, with the smaller hole in, the fatter hole out. For Presta, the plastic goes in peg first, and the rubber gasket goes in fat hole in, skinny hole out. If you have the gasket and plastic insert mismatched, the thing won't screw together. from Beth's question, and your reply, I see that my pump is missing the plastic insert (the piece with the "peg"). As I bought it in a thrift store, clearly the original owner had the same issue after taking it apart, and put it back together without that piece. I am not sure it serves any "valve" role. As my pump seems to work fine without it, I suspect its purpose its not too important. With the peg up, maybe it interacts with the recessed pin in a Schrader valve. For a Presta valve, with its more protruding pin when open, that is why the peg has to be downwards. As I don't have Schrader valves, maybe that is why I don't need the plastic insert. But maybe if I can find a suitably-sized plain plastic grommet, I will put that in there just to fill in the space underneath the rubber gasket and make it a more compressed fit. Thanks for the instructions. After reading negative comments, was happy to follow yours. And it worked.